Yes, that’s my name and my picture, and most of the text is plagiarized from my résumé, but I don’t even have an Upwork account. According to the site, the scammers have done two paid assignments while posing as me. The scammers were trying to solicit work from her, using my identity and experience. 21 June 2016: Both I and the woman who contacted me report the fake profile to Upwork. Please be informed that we are alreadyinvestigating your report. Rest assured that we will take appropriateaction according to our policies and processes. We do appreciate your effort in keeping theintegrity, safety and quality of the Upwork Marketplace and we wish you successin your endeavors. We will now close this Support ticket. Pleaselet us know if we can be of any additional help. But they don’t close the account. They do, however, send me a “satisfaction survey” for the support ticket. I do a bit of looking around, and it unsurprisingly turns out this happens a lot. After I responded in the last thread, their social media folks reach out and offer to expedite the case. The fake profile is hidden from anonymous users, but if you create an account and log in to upwork.com, it’s still there. This is not progress. 23 June 2016: I email support again and note they’ve hidden the profile from anonymous users only. Thanks for your response. Kindly be assured that the the reported freelancer is already under review and necessary action would be taken on the user for fake account creation once proved. Thanks for your cooperation & support. 23 June 2016: I contact their social media folks again. Hi Craig, sorry for any confusion this has caused. Our Team is still currently investigating this. Once their investigation is complete, they will update you via your ticket. We appreciate your continued patience and hope to get this resolved soon! 5 July 2016: It’s now been two weeks since I first reported the scammers. I email support again. Thank you for patiently awaiting our response and please accept our apologies for the late response as we have received high volume of requests recently and we are trying our best to address all concerns as promptly as possible. Please be assured that appropriate action has already been taken on the reported fake profile as defined in our Terms of Service. Again, our sincerest apologies for your inconvenience. I’n not sure what “appropriate action” is supposed to mean, but the fake profile is still live on their site. 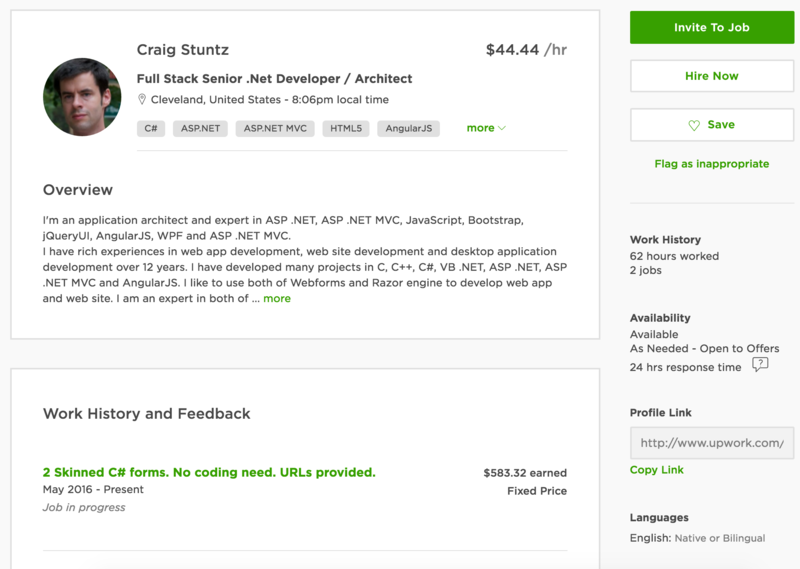 Upwork is making money using an identity they know to be stolen. 5 July 2016: I lose patience with their support team altogether and send a DMCA takedown to their legally registered contact. I can do this because the scammers copied text that I wrote. 5 July 2016: A member of their legal team acknowledges receipt of the request in less than half an hour. I am following-up to inform you that we have removed the profile in question. Thanks for your patience. I verify that this is true and thank her. The DMCA is really not the right tool to protect your identity. I probably couldn’t have used it if the scammers hadn’t stolen my writing as well as my identity. But it does have a strong requirement that the online service provider must “expeditiously” remove the copyrighted material. They are not allowed to just send assurances that they’re “investigating” it for weeks on end while profiting off of the scam. And, yes, DMCA takedowns are frequently abused.